Record MIDI ideas anywhere with the MIDI Mobilizer. PRESS RELEASE: Line 6, Inc, the industry leader in digital modeling technology for music-creation products, announces MIDI Mobilizer, the only MIDI interface for Apple iPhone and iPod touch. "We're very excited to announce MIDI Mobilizer, the first MIDI interface of its kind," remarked Marcus Ryle, SVP of New Business Development at Line 6. "It will connect MIDI musicians to the most portable platform ever, and allow them to play, record, and store any MIDI information." MIDI Mobilizer, a low-profile piece of hardware that fits into the standard 30-pin connector of an iPhone and iPod touch, together with MIDI Memo Recorder, the free app available for download at the Apple App Store, will present MIDI musicians with a host of solutions related to performing, recording and data backup. MIDI Mobilizer is compatible with millions of pieces of classic and modern MIDI (Musical Instrument Digital Interface) devices such as synthesizers, digital pianos, effects processors, and even Line 6 guitar amps and POD® products. 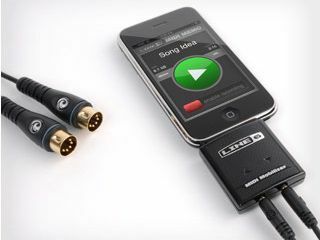 Virtually any gear with standard MIDI 5-pin DIN connectors can now be directly connected to an iPhone or iPod touch. Musicians who rely on computers to store and recall MIDI data during performances will celebrate the ease and reduced setup time afforded by an iPhone or iPod touch, and the simple interface of MIDI Memo Recorder. Plus, no longer will musicians need to travel with the extra weight, bulk and fragility of a computer. The size and simplicity of MIDI Mobilizer make it ideal for inspiration capture as well as for performance support. Whenever inspiration strikes, MIDI Mobilizer will allow for the capture and review of even the most fleeting of keyboard ideas. Recorded inspirations can then be emailed as an SMF (Standard MIDI File) and opened and edited within virtually any Mac or PC-based digital audio workstation. MIDI Mobilizer can also be employed as a safety net for performing musicians. During equipment failure, or when using rented gear for a gig, MIDI parameter data stored on an iPhone or iPod touch can be imported into replacement keyboards or other MIDI equipment to quickly restore the exact settings and sounds needed. MIDI Mobilizer is the most portable and affordable solution for transferring MIDI information. MIDI Mobilizer will ship April, 2010.